During the Christmas season of 2015-16, I was finishing up my two-year term with Eastern Mennonite Missions, teaching English and music at the PROMESA school in the San Jeronimo District of Cusco, Peru. I remember walking through Vino Canchón, the neighborhood market. I passed by colorful fabric and jewelry in the artisans' section and made my way through the mariscos, or seafood. The smell of semi-fresh fish wafted through the air as I continued through a tunnel of apples, oranges, grapes, mangos, chirimoya, and granadilla. Finally, the tunnel broke into an open courtyard where the ice cream man stood behind his faded blue cart. I passed by the ice cream man, offering a friendly wave, and headed down the potato aisle. Then, I heard an unfamiliar sound. I stopped walking. Did I hear children singing in the potato aisle? I listened closer. I was hearing a recording of a children's choir singing Christmas songs with confidence and proficiency! I quickly returned home to my apartment and found the children's choir on YouTube. The group is nationally known in Peru and it is called Los K'ana Wawakuna, led by Amilcar Soto. My brain began to spin. My mother, Janet Hostetter, directs the Shenandoah Valley Children's Choir, which is located in Harrisonburg, Va. We had recently discussed the possibility of taking the choir on a tour to Peru. My idea: What if we could bring these two children's choirs together to sing and experience an intercultural exchange? In March 2016, I officially ended my term in Cusco, Peru and returned to Harrisonburg, Va. Very shortly after my return to Virginia, I began to work with my mom and Amilcar Soto to coordinate a cultural exchange and singing experience between the Shenandoah Valley Children's Choir and Los K'ana Wawakuna. After a year and a half of preparation, prayer, conversation, coordination, collaboration, and planning, the Shenandoah Valley Children's Choir began their journey to Cusco in June 2017, where they would learn to sing like the Peruvians! The choirs spent four intense days together as they laughed, played games, and danced. The children also learned and rehearsed an original song written by Amilcar Soto. They recorded the song, and spent many hours in the hot sun on top of a mountain filming the music video. This song and music video, Kuska Takisun("Together We Sing"), was filmed and directed by Benson Hostetter, and was released on March 1, 2018, on YouTube. The song is sung in three different languages --English, Spanish, and Quechua -- and shares a message of breaking down cultural barriers and sharing peace and love with everyone, no matter where they come from. During the North American choir's time in Cusco, they not only collaborated with Los K'ana Wawakuna, but also experienced life with the local Mennonite Church and the PROMESA school. The choir brought bilingual books to the school, and each choir member was paired with a first or second grader as their "book buddy." Later, Janet Hostetter and the choir invited PROMESA students to participate in a music workshop where all the students sang and learned music together. The choir then participated in service projects where they helped local Mennonite churches by cleaning and painting. They also thoroughly enjoyed attending church services at the Mennonite churches in San Jeronimo and Huacarpay. They ended their time with a grand feast at our dear Mennonite sister Margarita's trout farm. As an alum of Eastern Mennonite Missions, the experience of bringing the Shenandoah Valley Children's Choir to my home in Cusco to collaborate with Los K'ana Wawakuna and interact with the Peruvian Mennonite community was beautiful in many ways. I was blessed and privileged to take part in "building a bridge" between two different cultural groups, and I thoroughly enjoyed observing the way that people from different parts of the world came together to sing and experience God's presence together. 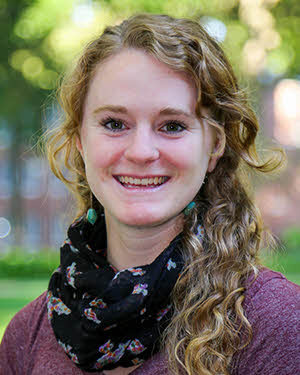 Brook Hostetter served with EMM from 2014–16 as an English and music teacher at the PROMESA school in Cusco, Peru.